Behind Owlerton Greyhound Stadium, not far from the Sheffield Wednesday ground, a long road called Livesey Street leads eventually to a bridge over the River Don – a recent replacement for a much older bridge washed away in the 2007 flood. On the other side of the bridge lies Wardsend Cemetery, last resting place of nearly 30,000 Sheffield people, forgotten until a group of Friends rescued it and drew attention to its fascinating history. It was established in 1857 as a churchyard extension for St Philip’s parish church, Shalesmoor, one of four “Million Act” churches in Sheffield, opened in 1828, bombed in 1940 and demolished in 1952. The church’s location, now unrecognisable because of road improvements, was opposite Green Lane Works, near to the Shalesmoor tram stop. The vicar of St Philip’s, Rev John Livesey, bought five acres of land alongside the Manchester, Sheffield & Lincolnshire Railway, and – largely at his own expense – built a lodge and an attractive little chapel designed by the Sheffield architects Weightman, Hadfield & Goldie. Rev Livesey had been minister since 1831 and vicar since the parish was created in 1848, “a tall man of fine presence, very active… genial, benevolent and kind hearted”. He bit off more than he could chew when he opened Wardsend Cemetery. The original sexton died shortly after the cemetery opened, and his successor, Isaac Howard, quickly made the place notorious. In 1862 the tenant occupying the lodge, Robert Dixon, complained of unpleasant odours from the floor of his coach-house and accused the sexton of disinterring corpses to sell to the Sheffield Medical School. Word travelled quickly and a crowd entered the cemetery on the evening of June 2nd to find a pit containing coffins, some containing corpses, one of which had clearly been dissected. They burnt down Howard’s house, and over the next few days obliged the authorities to arrest him. He in turn implicated the vicar, who had carelessly signed a burial certificate for a dissected corpse that remained unburied until discovered by the rioters. In fact the medical school obtained corpses legally from the Sheffield workhouse, but had transported them in sacks rather than coffins and allowed Isaac Howard to take them to the cemetery illegally in plain packing cases on a wheelbarrow. The real disgrace of Howard’s actions was that he exhumed corpses, particularly of children, to resell burial plots, a practice made easier by an unwise allocation of public graves beside the main pathway. Howard was sentenced to three months’ imprisonment, and the Rev Livesey to three weeks, but the judge, ruling that the vicar was only guilty of trusting the sexton’s word, back-dated his sentence to the opening of the assizes a fortnight previously. When Howard admitted his perjury Rev Livesey was pardoned. He returned to his benefice and served until his death in 1870, a total of thirty-nine years. Contemporary accounts of this notorious affair are at https://www.chrishobbs.com/sheffield/agraveaffair1862.htm. There’s more to the history of Wardsend than the often-told story of the 1862 riot. The cemetery is a chronicle of ordinary and extraordinary Sheffield people. While the movers and shakers of Victorian Sheffield were interred in the General Cemetery, pillars of Nonconformity gathered in the Zion Graveyard, and ordinary folk rested in municipal cemeteries such as Burngreave and Tinsley Park, Wardsend provided rest to a cross-section of society – soldiers from the nearby Hillsborough Barracks including George Lambert VC (1819-1860) who died of a burst blood vessel on the parade ground, victims of the Great Sheffield Flood which rushed past the site on the night of March 11th-12th 1864, and such fascinating characters as George Beaumont (died December 25th 1877, aged 23 years), killed during a football match when he climbed a wall to retrieve the ball and fell down a quarry face, Kate Townsend, Mrs Tommy Dodd (1849-1886) who with her husband travelled as show-people billed as “The King & Queen of the Lilliputians” and Tom Wharton (died 1933) – a life-long, celebrated Sheffield Wednesday fan, who missed only one home match in forty-six years [https://www.sheffieldtelegraph.co.uk/lifestyle/nostalgia/heritage-veteran-owls-fan-was-the-happiest-man-in-sheffield-1-8995148]. The Friends of Wardsend Cemetery [https://wardsendcemetery.wordpress.com] have rescued the place from decades of neglect after its formal closure in 1988, and they welcome visitors to a regular programme of events and tours. I admire the volunteers who devote their time to preserving an unassuming burial ground and keeping alive the memory of “the short and simple annals of the poor”. For details of Mike Higginbottom’s lecture Victorian Cemeteries, please click here. This entry was posted in Cemeteries, Sewerage & Sanitation, Sheffield's Heritage on August 5, 2018 by Mike Higginbottom. Alof de Wignacourt (1547-1622) is a towering figure in Malta’s history. His name is everywhere on the island. One of the most popular of the Grand Masters of the Knights Hospitaller who ruled the island from 1530, the young Wignacourt first attracted attention at the Siege of Malta in 1565. After his election as Grand Master in 1601 he undertook an ambitious programme of public works to improve and protect the island and particularly its newly-established capital of Valletta. Between 1610 and 1620 he constructed, at his own expense, six formidable watchtowers along Malta’s east coast to keep an eye on unfriendly vessels at the crossroads of Mediterranean shipping routes. Four of these survive – the eponymous Wignacourt Tower at St Paul’s Bay (1610), the St Lucian Tower at Marsaxlokk (1610-11), the St Thomas Tower at Marsaskala (1614) and St Mary’s Tower on the island of Comino (1618). Further series of watch towers were built by subsequent Grand Masters Giovanni Paolo Lascaris (in office 1636-1657) and Martin de Redin (in office 1657-1660), but they are generally smaller and less elaborate than the Wignacourt Towers. His other major engineering achievement was to bring fresh drinking water to the rapidly growing city of Valletta by means of the Wignacourt Aqueduct. The preceding Grand Master Martin Garze (in office 1595-1601) had planned an aqueduct to run some sixteen miles from inland springs at Dingli and Rabat, but hadn’t made much progress for lack of funds. Wignacourt took over and largely financed the project, and completed it within five years. The line runs from Attard, maintaining a constant gradient through underground pipes, and crossing depressions with arcades of limestone arches cemented with pozzolana, a volcanic ash of cement. It continued to supply water to Valletta and other towns along its route until the beginning of the twentieth century. Long stretches remain as a monument to Wignacourt’s enterprise, along with other structures, such as the Wignacourt Arch, otherwise known as the Fleur-de-Lys Gate, demolished after an RAF lorry ran into it during the blackout in 1943, and reconstructed in 2012-14. The community around the Gate takes its name from the three fleur-de-lys that appear on Wignacourt’s coat of arms. Other surviving structures include inspection towers at St Venera, Ħamrun and Floriana, and a series of fountains including the Wignacourt Fountain in the centre of Valetta. Alongside these physical achievements, Wignacourt has a claim on posterity as the patron of the artist Caravaggio (1571-1610), whose tempestuous career brought him to Malta in a brief period between 1607 and his expulsion from the Knights’ order at the end of the following year. During this time, as well as the two great canvases in St John’s Co-Cathedral in Valetta, ‘The Beheading of Saint John the Baptist’ and ‘Saint Jerome Writing’, Caravaggio painted a striking portrait ‘Portrait of Alof de Wignacourt and his Page’, now in the Louvre. This entry was posted in Cemeteries, Sewerage & Sanitation on May 1, 2018 by Mike Higginbottom. Understandably, Remembrance brings foremost to British minds and hearts the two World Wars and the conflicts within living memory – particularly the Falklands, Afghanistan and Iraq. In fact, British servicemen and women have given their lives in every year but two since 1945: http://www.telegraph.co.uk/news/2017/01/01/forces-have-first-year-since-1968-no-one-killed-operations. One such I found when I explored the vast cemetery in the centre of Hong Kong. On March 21st 1946 Driver Joseph Hughes of the Royal Army Service Corps was driving his three-ton lorry of ammunition and explosives when it caught fire. Joseph Hughes tried desperately to remove the burning netting covering the load of munitions, and then he tackled the blaze with a fire extinguisher. He survived the explosion but died of his wounds two days later. He was awarded a posthumous George Cross, because his sacrifice was not in the face of an enemy but was nevertheless an act “of the greatest heroism [and] most conspicuous courage in circumstance of extreme danger”. Not much seems to be known of Joseph Hughes, who came from the Glasgow Gorbals and would have been about twenty-four years old: http://www.rascrctassociation.co.uk/hughes.html. We honour such heroes, who are trained to run towards danger when the rest of us would run away, among all those who have given their lives in military service. This entry was posted in Cemeteries, Sewerage & Sanitation on November 11, 2017 by Mike Higginbottom. There’s not a lot left of the vibrant community that existed in Sheffield’s Lower Don Valley until the late 1950s. Two ancient structures – Carbrook Hall and Hill Top Chapel – survive from the seventeenth century. There are some twentieth-century buildings, such as Banners Department Store and the former Adelphi Cinema. Other, less prepossessing buildings have become significant simply because they survived – a number of banks and pubs, two Burton’s tailors, a chapel, a swimming baths and a library. In a corner behind the remaining shops on Attercliffe Road is a historic discovery. Parallel to the main road runs Zion Lane, a narrow alley still paved with bricks and stone setts. It takes its name from the former Zion Congregational Church, a place of worship since 1793, the site ultimately occupied by a grand Romanesque chapel with a tower and spire, opened in 1863. Inevitably, as the houses were cleared in the 1950s and 1960s the church became unsustainable. The building was sold in 1976 and the church became a furniture store until it burnt down in 1987 and was afterwards demolished. The Zion Sabbath School across the lane survives as a motor-repair business. Through all this, in the graveyard behind the church generations of Attercliffe people slept undisturbed. I photographed it in 1977, and another photographer recorded it in 1994, when it still looked like a burial ground. Eventually it became a jungle, which still belonged to the United Reformed Church, which needed to divest itself of the responsibility. With the help of a crowdfunding campaign and a Heritage Lottery Fund grant, the Friends have bought the graveyard and, in co-operation with its neighbours, made it accessible on specified open days. Among the graves uncovered and identified are Mark Oakes (died September 19, 1856) – assayer, refiner and crucible maker, John Pearson of Hall Carr House (died January 14th 1877) – whose daughter Martha was assistant organist to Zion Church, buried with his wife and sister in an elaborate grave marked with iron posts and railings, and Jonathan Wood (died October 20th 1848), – owner of Wood’s (or Bridge) Foundry, member of the Zion Church choir, buried with their two infant children in an tomb surrounded by iron railings that were once painted gold, alongside the graves of their daughter Catherine and her husband Frank Barnsley, and two grandchildren, aged one year and two months, close by. Most important of all, the Friends located the burial vault of the Read family. One of Joseph Read’s daughters, Mary Anne Rawson (1801-1887), was a notable anti-slavery campaigner who with her sister Emily Read was a founder-member of the Sheffield Female Anti-Slavery Society and its successor, the Sheffield Ladies Association for the Universal Abolition of Slavery. Another of his daughters, Elizabeth “Eliza” Read (1803-1851), married William Wilson (1800-1866), a nonconformist Radical who was chairman of the Nottingham Anti-Slavery Committee. Their son, Henry Joseph Wilson (1833-1914) was the “stern and uncompromising” Liberal MP for Holmfirth (1885-1912). His teetotal, non-smoking younger brother, John Wycliffe Wilson JP (1836-1921) became Lord Mayor of Sheffield (1902) on condition that alcohol should be banned at the Town Hall during his term. As Chairman of Sheffield Board of Guardians he instigated the development of cottage homes for orphaned children. Henry Joseph Wilson’s son, Cecil Henry Wilson (1864-1945) was Labour MP for Attercliffe (1922-1931 and 1935-1944). Cecil’s sister Dr Helen Mary Wilson was the first woman medical doctor in Sheffield and president of the Sheffield Suffrage Society. In this nonconformist, Radical, individualistic town, this self-made dynasty is working-class aristocracy and Mary Anne Rawson’s campaigning career entitles her to national recognition. Their unassuming, long-forgotten burial place deserves to be treasured and celebrated. It commemorates what made Sheffield. This entry was posted in Cemeteries, Sewerage & Sanitation, Exploring Attercliffe, Sheffield's Heritage, Victorian Architecture on July 4, 2017 by Mike Higginbottom. If you have the money and you want a mausoleum you might as well go to the best designer in town. 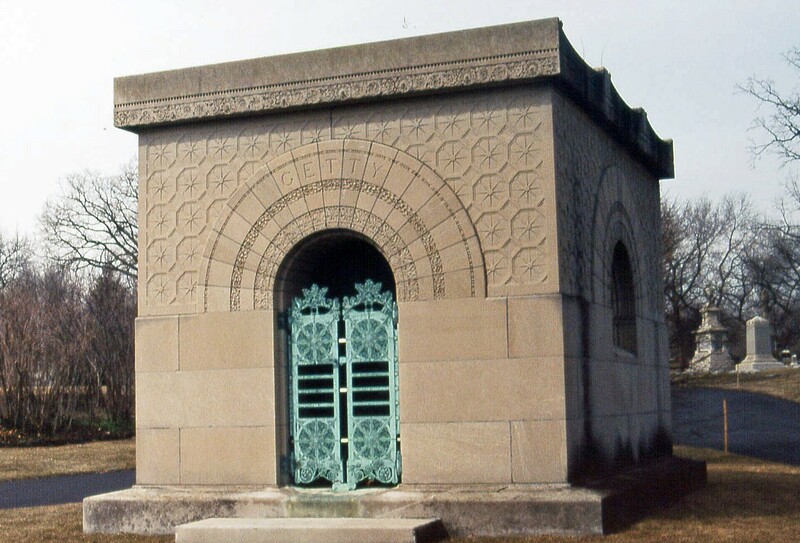 Henry Harrison Getty (1838-1919), the Chicago lumber baron (not related to the more famous oil-rich Getty family), commissioned Louis Henry Sullivan to design a family mausoleum after the death of his wife Clara Eliza Getty (1843-1890). Louis Sullivan (1856-1924) is one of the three greatest architects who worked in the city in the aftermath of the catastrophic fire of 1871. With his business partner Dankmar Adler (1844-1900), his pupil Frank Lloyd Wright and the distinctive Romanesque-revival architect Henry Hobson Richardson (1838-1866), Sullivan rose to the challenge of building quickly and building big to rebuild the devastated centre that we now call The Loop. Sullivan and Adler were particularly adept at using the new steel-frame construction to contrive new stylistic rules to make sense of the changing proportions of the high buildings that became known as “skyscrapers”, such as their Auditorium Building (1889). But Sullivan could work exquisitely on a small scale, and his Getty Tomb in Graceland Cemetery is a gem. Sullivan is the modern originator of the expression “form follows function”, which he himself drew from the Roman author Vitruvius – “firmitas, utilitas, venustas” – “solid, useful, beautiful”. So Clara Eliza Getty’s tomb combines immaculately plain ashlar with a delicate pattern of octagons in which is set a fine Romanesque doorway of plain stonework finely decorated, that frames delicate bronze doors by Yale & Towne. The sides of the mausoleum echo the doorway with semi-circular bronze windows. Henry Harrison Getty was laid to rest with his wife, and in due course their only daughter Alice (1865-1946) joined them. This entry was posted in Cemeteries, Sewerage & Sanitation, Exploring Chicago, Victorian Architecture on November 18, 2015 by Mike Higginbottom. Cremation became a legal and practical alternative to burial when the Cremation Society inaugurated their Woking Crematorium in 1885, but the practice remained expensive and practically difficult while Woking remained the only crematorium in the country. Commitals remained in the low hundreds per annum, peaking at 301 in the year 1900. By the start of the new century crematoria had begun to appear in the north, in Manchester (1895), Glasgow (1895), Liverpool (1896) and Hull (1901). The Cremation Society had attempted to find a site in London for some years before they bought a twelve-acre site at Hoop Lane, Golders Green, directly across the road from a recently opened Jewish cemetery. 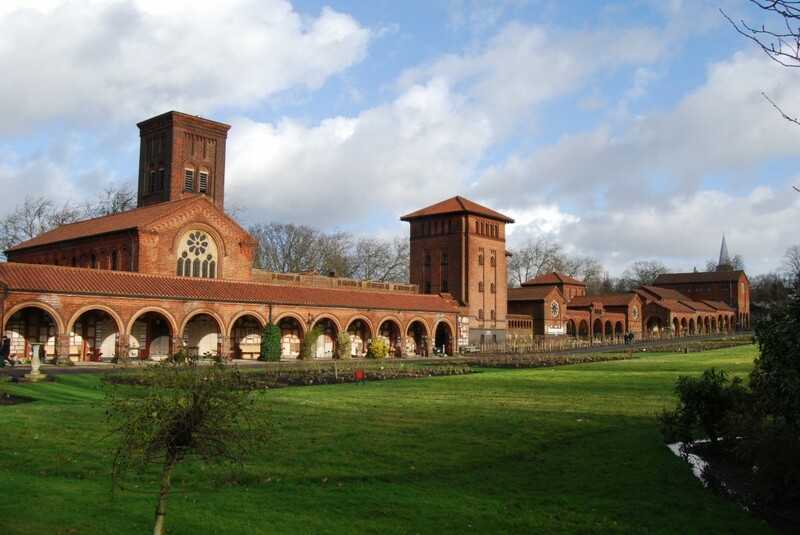 Golders Green Crematorium opened in 1902, designed in red brick by Sir Ernest George (1839-1922) and Alfred Bowman Yeates (1867-1944). Not only was this the first crematorium in the metropolis, but it was the first anywhere in Britain designed by architects of national repute. From the start its policy was secular – rites of any religion, and none, were and are acceptable – and the Lombardic Romanesque style was deliberately unecclesiastical. Furthermore, the garden layout designed by William Robinson (1838-1935) looked as little like a Victorian cemetery as possible. The facility gained popularity, and its existence was influential in making cremation the preferred means of disposal in the UK. In 2013, 74% of funerals were cremations. Cremation gradually became respectable, rather than radical. The first member of the royal family to be cremated was Princess Louise Margaret, Duchess of Connaught and Strathearn (1860-1917), Queen Victoria’s daughter-in-law. Her ashes were transported from Golders Green to the Royal Burial Ground at Frogmore in an urn inside a conventional coffin. After the actor Sir Henry Irving (1838-1905) was cremated before burial in Westminster Abbey, the Dean and Chapter moved to a policy whereby burials in the Abbey had to be preceded by cremation to save space. The only exception is the Percy Dukes of Northumberland, who are still free to use their family vault in the Abbey for burial if they wish. A parallel rule was adopted by the Dean and Chapter of St Paul’s Cathedral. Reading the memorial plaques in the cloisters at Golders Green makes one wonder who wasn’t cremated there. The most recent well-known funerals there have included John Inman (1935-2007), Michael Foot (1913-2010), Amy Winehouse (1983-2011), Peter O’Toole (1932-2013) and Doris Lessing (1919-2013). This entry was posted in Cemeteries, Sewerage & Sanitation on April 25, 2015 by Mike Higginbottom. Abney Park Cemetery, in Stoke Newington in north London, is the nineteenth-century Campo Santo of the Dissenters, freighted with ministers, missionaries and other dignitaries from the Congregational, Baptist, Methodist and Salvation Army denominations. It was laid out as a garden cemetery on land that has strong associations with seventeenth- and eighteenth-century nonconformity. In particular, the long-term residence of the great hymn-writer, Dr Isaac Watts (1674-1748), stood on the site and though he is buried at Bunhill Fields in Islington, his statue stands at the centre of the cemetery. It was sculpted by Edward Hodges Baily RA FRS (1788-1867), who also carved the statue of Lord Nelson that tops the column in Trafalgar Square. Abney Park was a particularly desirable place for nonconformists to be buried because, for the first forty years after it opened in 1840, its peculiar legal status meant that burial fees were not paid to the local Anglican clergy – a great bugbear for non-Anglicans almost everywhere else. Perhaps the most evocative monument of all in the cemetery commemorates PC William Frederick Tyler (c1878-1909) who was shot dead in the spectacularly desperate Tottenham Outrage. Two armed Latvian anarchists, Paul Helfeld and Jacob Lepidus, set out to steal the wages (amounting to about £80 in coin) from the factory where they worked. They were pursued by officers from the nearby police station. In the chase that followed, Helfeld and Lepidus used their guns freely, and Helfeld shot PC Tyler in the head when asked to surrender. After a chase that involved two hijacked trams, a horse-drawn carriage and a milk cart, both robbers shot themselves: http://www.pfoa.co.uk/uploads/asset_file/The%20Tottenham%20Outrage%20-%201909%20v3.pdf. 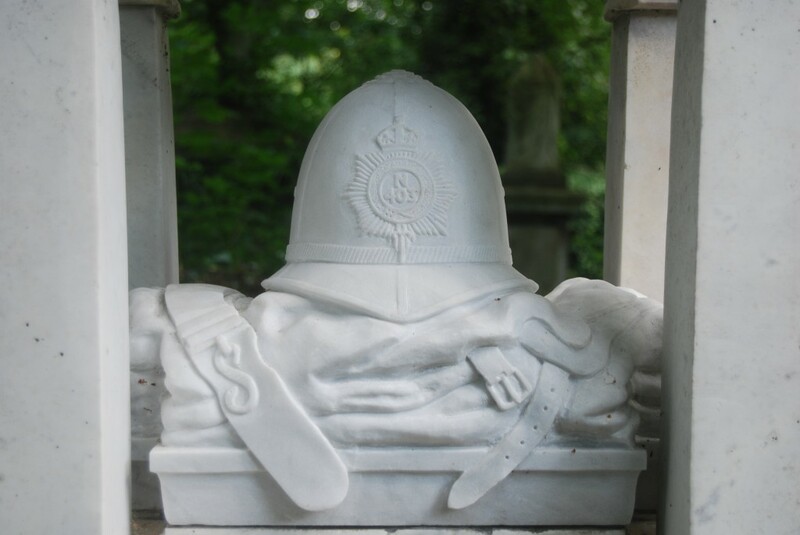 PC Tyler was given a ceremonial funeral, and lies in Abney Park Cemetery: his monument, beautifully carved in white marble, shows his helmet and his cape neatly folded and carries his badge number. Nearby lies the ten-year-old schoolboy Ralph Joscelyne who was caught in crossfire during the incident. PC Tyler’s death and the bravery of his colleagues led directly to the establishment of the King’s Police Medal. 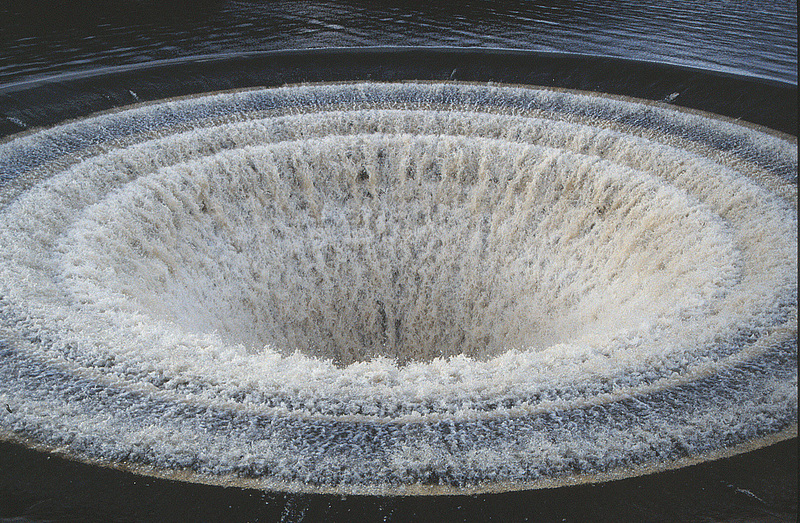 This entry was posted in Cemeteries, Sewerage & Sanitation on April 20, 2015 by Mike Higginbottom. The Crossness Pumping Station, located in the midst of the treatment works that deals with all the sewage of South London, represents one of the most remarkable stories of the post-war industrial-heritage movement. I first visited Crossness with a Matlock Travel Society group in 1987. Our Derbyshire coach-driver was astonished that we should travel all that way to have a sandwich buffet in a sewage works. At that time the engines had been disused since the 1950s, left to rust, and were prey to thieves and more than usually intrepid vandals. The lower levels of the engine house were filled with a hundred tons of sand and cement to prevent accumulation of methane. The degree of dereliction was spectacular. The small group of enthusiasts from the Crossness Beam Engines Preservation Group talked hopefully of bringing the place back to life. It was, frankly, hard to believe. In 1993, after protracted negotiations, the Crossness Engines Trust, which arose from the earlier Preservation Group, secured a long lease from Thames Water of the engine house and its immediate surroundings, and set about restoring Prince Albert, the last of the four engines to have operated in 1953. There followed a ten-year saga of patient, unglamorous, physical restoration work, much of it carried out by a core team of not much more than a dozen: http://www.crossness.org.uk/restoration.html. By 2003 Prince Albert gleamed as good as new. When the beam moved under steam for the first time in fifty years, grown men grew teary-eyed. The power of live steam is emotional as well as physical. It makes the earth move. 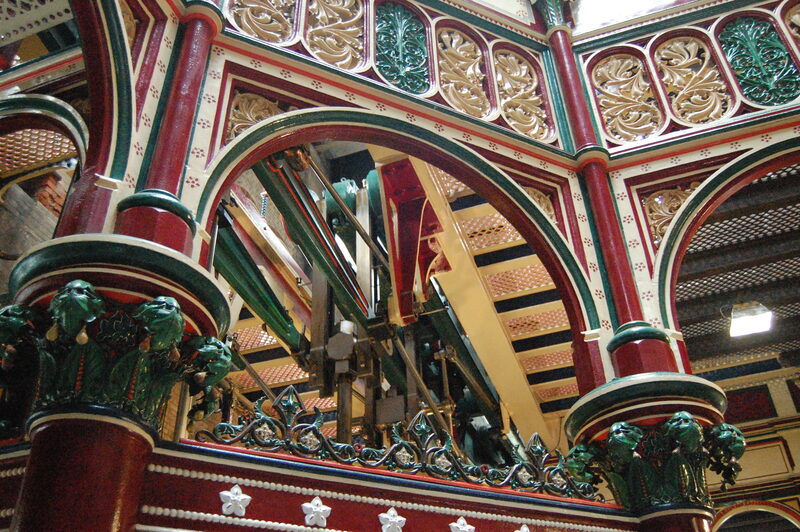 Crossness Pumping Station features in Mike Higginbottom’s lecture Temples of Sanitation. For details, please click here. This entry was posted in Cemeteries, Sewerage & Sanitation, Victorian Architecture on April 15, 2015 by Mike Higginbottom.